Bang & Olufsen's products exist outside of the realms of regular TVs. Everything the company produces tends to be ultra-stylish and priced at a level that immediately deters most buyers. 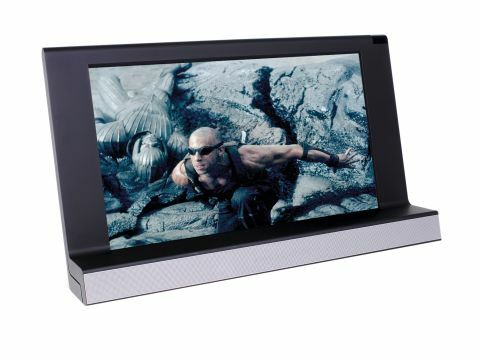 The BeoVision 8 is a 26-inch LCD costs £1,800 - a sum which could get you a 42-inch LCD or plasma screen. That is a lot of cash to spend on a 26-inch TV, but the BeoVision 8's design really is a cut above most small flat screens: the build quality is tough and solid (the cabinet has a rubberised texture) and the unadorned frame beautifully clean and understated. Aside from a faint company logo on the speaker panel and a power light, there's nothing to draw your eye from the screen. The one thing we don't really like about the design is the desktop stand, which causes the screen to lean back at a slight angle. This isn't really a problem if you're using it as a PC monitor, but it could mean the screen is angled slightly away from you otherwise. There might be some ergonomic reasons for tilting a TV screen in this way, but none that we're aware of. Some basic composite and stereo line inputs are located on the side of the screen, but all the rest of the connections are tucked away at the back, behind a removable cover. Hi-def kit can be hooked up through either an HDMI (disappointing, as these days two HDMIs are the expected minimum) or component video jacks, and you also get two Scarts for standard-def gear. Finally, there's a VGA input for a PC. B&O TVs have always been idiosyncratic when it comes to setting them up, and the BeoVision 8 is no exception. The manual is fairly vague at times, and you'll have to plod through several menus to assign your external devices to the three available AV channels. Even after doing this, we found we couldn't assign an audio input for both the component video and the VGA inputs at the same time; needless to say, this isn't the sort of thing you expect to see after you've shelled out nearly two grand. B&O's standard Beo4 remote control is a welcome partner to this TV. Able to control any B&O product, even if they're in another room and visible in the dark, there's little standard about the Beo4. Thankfully, the BeoVision 8 shapes up much better in the performance department. While it isn't blessed with a particularly strong contrast ratio, and therefore struggles to produce really deep, convincing blacks, it delivers every other aspect of its pictures with panache. Colours are vivid and rich when the material is right, and when you watch hi-def material the extra detail shines through (although you need to be sitting quite close to get the full benefits of hi-def on this 26-inch screen). The response time is a very fast 6ms, so ghosting is barely noticeable, even with quick-paced games and sport. Audio quality is exceptional too, and B&O has clearly put a lot of effort into making the compact speakers sound unusually powerful. They're designed so that, despite some good stereo separation, dialogue appears to come from the centre of the screen, and this seems to work well. Unfortunately, despite the great performance and even better looks, the B&O doesn't comes close to justifying that lofty price tag.